Considerably more bright-eyed and bushy-tailed, we started a very foggy second day with a trip to the Vimy memorial. It turns out that our new-found energy would come in handy. By the end of the day, we will have covered over 200 km, visited multiple cemeteries, travelled 30m underground, and visited sites of significance to both WWI and WWII. 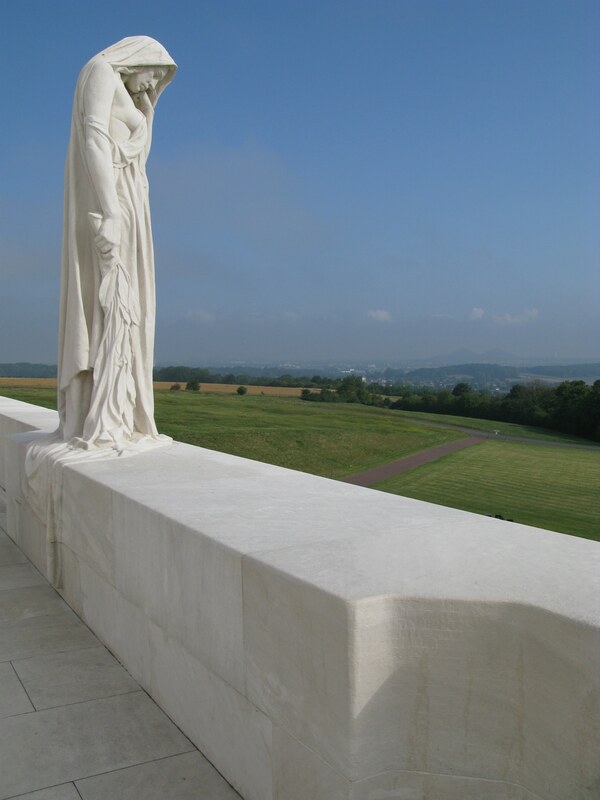 Vimy Ridge and the memorial are on a very large 100 hectare patch of ground bequeathed to Canada as a permanent memorial to the Canadian contribution in the WWI liberation of France. Aside from letting grass & trees grow, much of the site has been left exactly as it would have been at the end of the conflict. 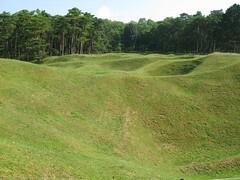 Remains of trenches, deep artillery craters and even deeper mine craters cover much of the site. 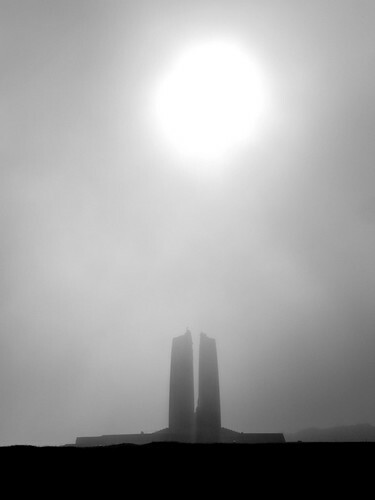 From a vast open undulating field of these craters appeared the backlit outline of the Vimy memorial through the mist. I still get shivers thinking about it. Our experienced guides brought us to the site early, before the very popular memorial gets adorned with visitors. This allowed the snap-happy members of our crew (guilty) to get lots of shots of the site without all those pesky tourists in the way. I tried my best to do the place justice, but to truly experience it, you have to go there in person. Similar to the Thiepval monument, this monument is dedicated to the Canadian WWI dead with no known grave. The monument is placed at the leading edge of the ridge, which allows a spectacular view of the surrounding countryside. It was this vantage point that made this a strategic piece of ground for the allies re-take, and for the Germans to hold. All of these memorials are intended to mark the sacrifice of our countrymen, but also to serve as a reminder of war’s brutality; a war supposedly ‘to end all wars’. So it is with a sad irony that we can imagine the 1936 unveiling of this memorial in front of some 50,000 veterans by King Edward VIII and French President Albert Lebrun, many of whom would shortly be thrown back into yet another war (see photo). A short few years later, Lebrun would flee Paris as the Germans seized power.During the German occupation of France, a propaganda war erupted with the Vimy Memorial at its centre. Hitler visited the site with cameras rolling to show that the site had not been destroyed, as allied propaganda had suggested. Thiepval also attests to the Nazi’s tendency to protect war memorials, as long as they did not celebrate the defeat of the Germans in the previous war. It is pretty standard practice in war to eliminate anything (or anyone) that doesn’t fit the narrative that the new leadership is trying to create. Chris Hedges‘ book “War Is a Force that Gives Us Meaning” covers this topic in great detail, if you would like to explore this more. Luckily the Vimy memorial wasn’t a threat to the Nazi’s, and in fact served their purposes to keep it intact. In the chaos of war, little effort is expended on recovering shells that did not explode, or retrieving large quantities unexploded explosives that were intentionally buried under enemy positions. Every spring you can see artillery shells lined up for disposal next to farmers’ fields, the bounty provided by the annual frost heave. As a result, much of sites like Vimy are off-limits to the public, due to the large concentrations of unexploded ordinance, unexhumed human remains and other things this should just be left alone. These unexploded caches occasionally make for an especially exciting lightning storm. Allies to the left, Germans to the right, big crater in the middle. Our next stop was the Monument Tunnel Cemetery, which is also on the Vimy site. If you click on that link, you will see a satellite view of the site, where you can see large geometric circles running at a slight diagonal up the middle. These are actually craters that are 100ft across or more and over 30ft deep (they were even deeper before years of rain and erosion). Even the largest artillery shells, some up to 16″ in diameter, can’t create this kind of impression. These large craters are the result of successive mining (dig, bury tons of explosives, boom, repeat) along this front, the location of a long stalemate in WWI. At either side of these craters were the allied and German lines. They were so close that opposing sides could easily hurl grenades or insults at each other. One surprise to me was that the etiquette of war has changed considerably over the years. While WWI was characterized by military leaders regularly throwing away the lives of many of their solders to make negligible gains of territory, opposing soldiers would occasionally help each other during lulls in battle (maybe a case of cause and effect). After a cease-fire, it would not be uncommon for the winners of a lopsided battle to help their opponents carry their dead and wounded back behind their lines. WWII pretty much put this practice to bed. This was likely due to the faster pace of battle created by more effective tanks and aircraft, and the axis being led by bunch of genocidal lunatics. 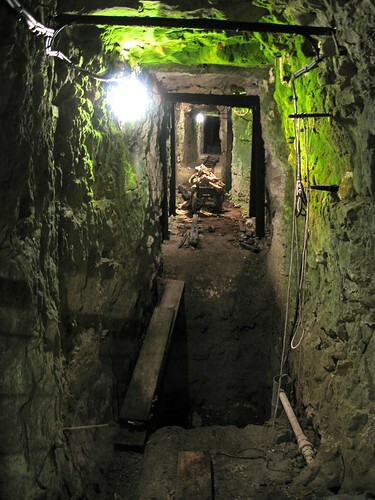 Much of WWI was fought underground, and the Monument Tunnel Cemetery has a very well-preserved mine (called the Grange Tunnel) that the allies used to move men, weapons and other supplies, safe from artillery bombardment. Apparently, safety means putting at least 30 ft of earth and chalk between you and the surface. Chalk is the predominant substance miners would have to dig through, to create the many kilometres of tunnels that still exist under much of France. Next on the agenda, was to visit several large grave sites representing German, French, and Commonwealth forces. These visits allowed us to see how the different countries commemorated their war dead, and to give us a scope of the loss. Unlike the Commonwealth grave sites, placed near where the soldiers fell, French, German and (as we will see later) American graves tended towards very large centralized grave sites. The first of these centralized sites we visited was the Neuville-St.-Vaast WWI German war cemetery (Deutsche Kriegsgräberstätte). Here lie the remains of some 44,820 German soldiers from WWI, collected from hundreds of sites, and marked with iron crosses. These iron crosses extend almost as far as the eye can see, yet each iron cross actually represents 4 German soldiers. Also a clear sign that this is a German WWI and not WWII grave site, is the occasional grave stone representing a fallen Jewish soldier. Next we visited the La Targette French cemetery, and the adjacent (and much smaller) Commonwealth cemetery. Like the German graves, the majority are marked by crosses, but in this case are made of cement, not iron. I wasn’t able to find a reference to the number of graves at this site, but doing a quick grid count via Google Maps it appears that there are over 7,000 French graves at this site. 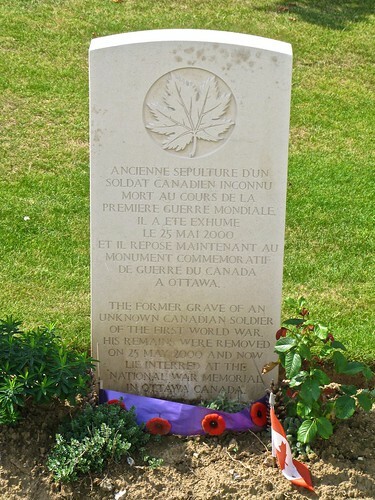 Our final cemetery of the day is of great significance to Canadians, as it was the source of the remains now buried at the Tomb of the Unknown Soldier in Ottawa. This Commonwealth cemetery, called the Cabaret Rouge British Cemetery, contains about 8000 graves, and over half are unknown soldiers. All of the Commonwealth cemeteries are maintained immaculately by the Commonwealth War Graves Commission, which maintains almost 1.7 million war graves in 150 countries. 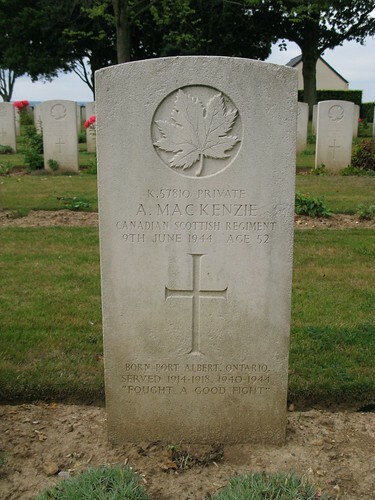 One unique aspect of the Commonwealth graves is the space they reserve on each headstone for a personalized message from family, as well as detail on rank, and regiment. Markers of the French, German and American graves rarely have any more information than the name, rank, DOB and date of death. This was our final WWI-focused stop, and our last stop in the Pas-de-Calais region. With our brains getting really full, and jetlag starting to reassert itself, it was a good time to relax on the bus ride to the Dieppe area. Before arriving in Dieppe proper, we stopped in a seaside village named Puys, which was codenamed ‘Blue Beach‘ in the failed Canadian and allied raid of Dieppe (Operation Jubilee). This was our first opportunity to see the imposing cliffs, and remnants of the German fortifications, most of which were constructed after the raid. Even without these fortifications, this beach was a risky landing point. Coming in slightly off course, as some troops did, you risk getting trapped against the cliffs on either side of Puys. Sandy beaches usually provide some benefit to landing troops, since the energy from exploding shells is absorbed by sand. The beach at Puys is comprised of golf-ball size rocks that artillery turns into deadly projectiles; yet one more thing to make the Canadian’s welcome to mainland Europe less than pleasant. 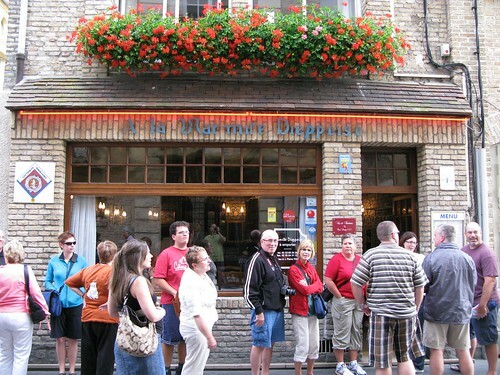 Our culinary experience in Dieppe. Our second night was spent in Dieppe, at a really nice Mercure hotel right on the beach, and adjacent to the beautiful Château de Dieppe. We had our first group dinner, which ended up being quite humorous (at least to me). Mark, our tour director, had organized some fine dining to sample the local specialty, which happens to be fish. I am quite adventurous when it comes to food, so I was looking forward to it, but many in our group were quite flustered at having a fixed menu of fish! After allowing a sufficient level of anxiety to build up, other options were made available, but I chose and enjoyed the fish. Walking off dinner allowed us to tour the beautiful historic town of Dieppe on our short walk back to the hotel. A bit of perspective on the layout of the town would come in useful the next day, when Mike B. explained the raid and indicated how far into town the Canadians actually had made it before capitulating. A solid sleep awaited after another long day. Fish?! Is that what that was? What about the bug on top?